Britain’s first Olympic champion, Launceston Elliott was born in India to Charles Elliot and his third wife Ann, but he was named for the Tasmanian city in which he was conceived. He spent part of his early childhood in Australia and it was only when his father, a kinsman of the Earls of Minto gave up his post as a magistrate in India in 1887 and returned to farm in Essex that young Launceston saw England for the first time. 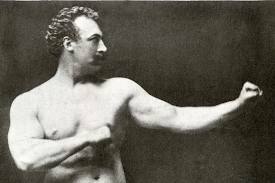 He soon showed a keen interest in weightlifting and in 1891 at the age of 16, at which time he was already a pupil of the great Eugen Sandow, he entered for the first British weightlifting championship and made a creditable showing in a contest won by Lawrence Levy. In 1894 he won the British title and in 1896 he went to Athens for the first modern Olympic Games. Elliot was often described as one of the most handsome men of his generation and he certainly appealed to the Greeks. The 1906 Official Report noted: “this young man attracted universal admiration by his uncommon beauty. He was of impressive stature, tall, well-proportioned, his hair and complexion of surprising fairness”. Clearly the Englishman created something of a stir in Athens and one paper carried the report that “his handsome figure procured for him an offer of marriage from a highly-placed lady admirer”. Elliot was evidently not distracted by the publicity – he won the one-handed lift and his second place in the two-handed rested on a disputed decision. He raised the same weight as the winner, Viggo Jensen of Denmark, but as Elliot moved one of his feet during the lift, the Dane was awarded first prize on the basis of having a “superior style”. In Athens, Elliot also ran in the 100 metres, took part in the rope-climbing event and was fourth in the Greco-Roman heavyweight wrestling. In 1899 he literally went from strength to strength and set four new British records at the amateur championships. Around 1905, he turned professional and put on a Music Hall act with a partner named Montague Spencer. The two strongmen performed amid scenery representing the Roman arena and, bedecked in the garb of gladiators, they engaged in a mock contest during which they used the cestus, trident, net and other weapons of the arena. At the end of the show, Elliot gave exhibitions of strength, the favorite of which was to support across his shoulders a long metal pole from which, at each end, was suspended a bicycle and rider. With this load Elliot would start revolving, slowly at first, but finally at such a speed that the “riders” would be swung into a horizontal position. Despite being offered the hand of a “highly-placed lady” in Athens, Elliot married Emelia Holder, the daughter of a Kentish vicar, in 1897. In 1923, they settled in Australia, the scene of Launceston’s early childhood, and he became an honored member of a group of old-time athletes. In 1930, he failed to recover from an operation for cancer of the spine and is buried in the Fawker Cemetary in Melbourne. On reading that Elliot was born in kskadini wrote a post on my FB which was made a story in the local news paper in Karnataka last year. People from the town were really excited to know that a boy born in the town has made a history. I also visited Kaladagi and saw the possible place he was born namely the bungalow of Collector.